The Danish wind giant buys a leading U.S. offshore wind developer to compete with European rivals for gigawatt-scale opportunities. 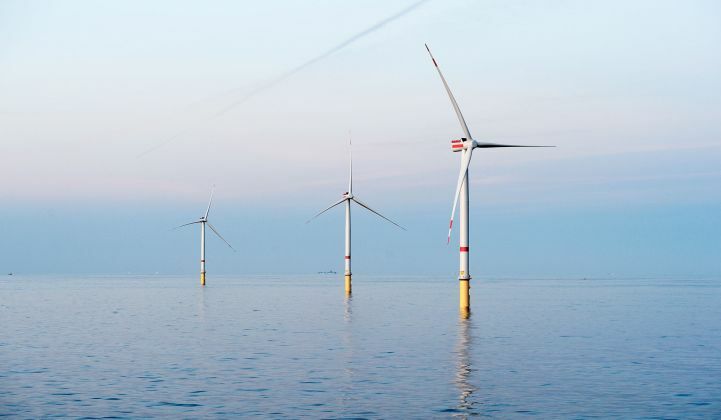 Ørsted will acquire Deepwater Wind for $510 million, making the Danish wind power giant a leading player in the European competition to capture the fast-growing U.S. offshore wind market. Monday’s deal, if approved by regulators, will create a U.S. subsidiary called Ørsted North America that has a combined 8.8 gigawatts of projects in development up and down the East Coast. That’s a significant share of the 10 gigawatts of offshore wind capacity being planned for the region. Deepwater Wind owns the first U.S. offshore wind farm, the 30-megawatt Block Island farm off the Rhode Island coast, which came online in 2016. It also has “long-term revenue contracts in place or pending finalization” for projects in Rhode Island, Connecticut, Maryland and New York totaling 810 megawatts of capacity. It also has about 2.5 gigawatts of offshore wind development potential across three lease areas in Massachusetts and Delaware, of which 1.2 gigawatts are being developed through an equal joint venture with PSEG, a leading New Jersey utility. Ørsted, formerly named Dong Energy, has its own 5.5-gigawatt portfolio of U.S. offshore projects. That includes development rights for up to 2 gigawatts at the Bay State Wind site off the coast of Massachusetts in a joint venture with Eversource; development rights for up to 3.5 gigawatts at the Ocean Wind site off the coast of New Jersey; and exclusive rights with Dominion Energy to discuss the potential development of up to 2 gigawatts of capacity, as part of its deal to build 6 gigawatts of turbines for the utility’s Coastal Virginia Offshore Wind Project. Ørsted’s acquisition will cement the hold of European wind giants on the burgeoning U.S. market, noted Anthony Logan, North America wind power research analyst with Wood Mackenzie Power & Renewables. “The U.S. offshore sector is now entirely European,” he said in a Tuesday email. Even U.S. Wind, a Baltimore, Maryland-based company developing projects off that state’s coast, is owned by Renexia, a subsidiary of Italy’s Toto Holdings, he stated. The only U.S. players are utilities in cooperative efforts led by Ørsted, including PSEG in New Jersey and Dominion in Virginia. Of these contenders, “Ørsted is now the clear leader in terms of scale, which is crucial at this stage in the sector’s development,” Logan said. Only Iberdrola’s Avangrid Renewables, which has won major contracts in Massachusetts and holds leases off the North Carolina coast, can claim a similar breadth of scope, he added. “Ørsted needed to make big moves if it is committed to the U.S. market, after starting off on the wrong foot during the Northeast procurements,” he said. With Deepwater’s leases and developments now in hand, the company “has the lease areas to bid into any currently announced solicitation on the East Coast,” he concluded. U.S. offshore wind development has notoriously lagged behind European countries and, more recently, China, now the world’s third-largest offshore market. European nations have together installed nearly 16,000 megawatts of offshore wind capacity, while the U.S. has only the 30 megawatts provided by Block Island, and the legacy of the failed Cape Wind project to contend with. But in the past five years, East Coast states have led a massive new push into offshore wind. New York has set a target of 2.4 gigawatts of offshore wind capacity by 2030, and later this year plans to hold a solicitation for 800 megawatts of offshore wind, in coordination with NYPA and the Long Island Power Authority, with winning bids to be announced in the second quarter of 2019. In May, Massachusetts and Rhode Island contracted for a combined 1.2 gigawatts of offshore wind power, including the 800-megawatt Vineyard Wind project to be built by Avangrid and Danish investment firm Copenhagen Infrastructure Partners, and a 400-megawatt offshore wind project with Deepwater Wind. Massachusetts has mandated that utilities Eversource, National Grid and Unitil must procure1.6 gigawatts of offshore wind capacity by 2027. And last month, New Jersey approved a 1.1-gigawatt offshore wind solicitation, the single largest of any state to date, as part of its goal to reach 3.5 gigawatts of capacity by 2030, another record. According to a Department of Energy report released this month, there are now 25,464 megawatts of offshore wind projects planned in 13 states.